* 40,000 Buyers From 60+ Countries! * 3500 Booths! 1,000,0000 Square Feet! * More New Racing Products Than Anywhere On Earth! Reported from Australia — looks like the reps are busy down there! What should we expect? Stay tuned. Winning Brands is attending the June 25, 26 & 27th House-Hasson Hardware Dealer Market Booth 509. Attached is the Winning Colours Stain Remover ad in the House Hasson Hardware Magazine called Toobox being distributed prior to the show. What the Heck is IGA? QUEENSLAND, AUSTRALIA—(Marketwire - March 30, 2009) - Winning Brands Corporation (PINKSHEETS: WNBD) (FRANKFURT: WMU) www.WinningBrands.ca reports that its breakthrough stain removing solution, Winning Colours Stain Remover, is now officially on the shelves and running in Australia's grocery sector. In a neck and neck race as to who would be first, Coco's Fresh Food Markets and IGA both have earned the praise of Winning Colours Australia Ambassador Kori Walsh. "The first bottles were delivered to Coco's Fresh Food Markets while IGA is also taking a leadership role; they both want Australians to find their own favourite uses for this intriguing new product from North America. Both teams are highly responsive to the needs of their consumers. I must say, I am pretty happy with the first week's results," Kori states enthusiastically. (IGA Photos attached). 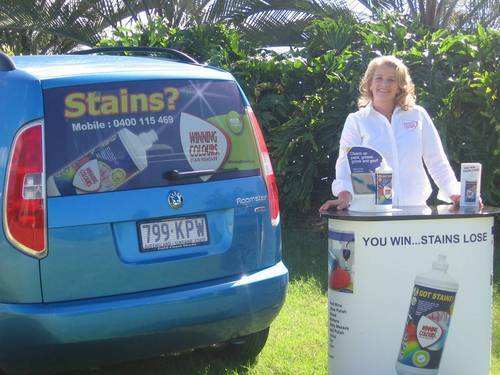 In Australia, Winning Brands will focus initial sales development on the State of Queensland in order for Winning Colours Stain Remover to gain solid experience and feedback from consumers and retailers before going national. Of the current grocery partners, IGA already has the ability to carry the program across Australia in due course, where approximately 1,000 stores operate under that banner. 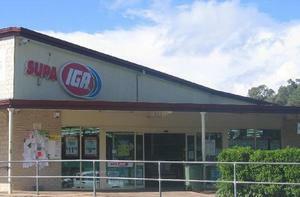 (www.iga.net.au) Internationally, the IGA organization has approximately 4,000 stores including the United States and Canada amongst other countries. Winning Colours Stain Remover has also implemented an Australian national toll-free number for customer service purposes: 1 300 506 607. 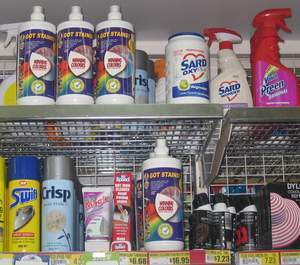 In February 2009 Winning Brands announced that its second shipment of Winning Colours Stain Remover was leaving the U.S. for Australia to commence initial grocery store sales in Australia Q2 2009, however the participating grocers were not yet named. As of today, the project is ahead of schedule with product now on shelves in participating stores in the State of Queensland. Walsh confirms that even the February shipment of Winning Colours to Australia ended up being largely sold in advance despite having been doubled in size at the last moment before departure to approximately 2 tons of skids of mixed sizes. A 3rd shipment is now a matter of immediate priority. "We have 19 more IGA stores committed and awaiting the arrival of the 125ml bottle to round out the product mix between large and small sizes. Approximately 40 more stores will provide feedback regarding next steps in April," Kori states. In Australia, the Manufacturer's Suggested Retail Price (MSRP) for the Winning Colours Stain Remover 909ml bottle, including tax, is AUD $16.95. This is an approximate transfer of the MSRP U.S. $9.95 + tax from the United States at prevailing rates of currency exchange; U.S. sales tax rates vary. This pricing enables Australians to enjoy Winning Colours Stain Remover at approximately the same value proposition as North American consumers. The fact that Winning Colours is a concentrated product means that it has become one of the world's most affordable high-quality cleaning products at a 10:1 rate of dilution with water, as well as being competitively priced within the stain removing sector where Winning Colours Stain Remover is used full-strength. The ability of Winning Colours Stain Remover to switch between being a concentrated stain remover and a diluted general purpose multi-cleaner has helped the product gain a devoted following in Canada and increasingly the USA. Winning Colours Stain Remover is considered remarkable for its gentleness to skin and is winning acclaim from a wide range of consumers, both household and commercial, for its versatility. 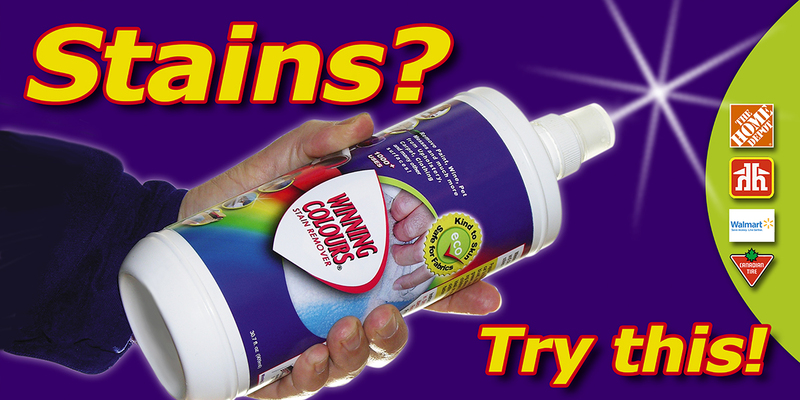 YouTube now carries a recently completed 4-minute Winning Colours Stain Remover highlight video designed for retailers in the hardware sector: http://www.youtube.com/watch?v=LNc5jDwFl_s. The basic message is relevant to a variety of other sectors because of Winning Colours' wide range of uses in other areas of the home and work..
Winning Brands is adopting a three stage approach to the Australian roll-out of Winning Colours Stain Remover to match the strategy deployed in North America; local first, then regional, followed by national when the supply chain issues are proven satisfactory. Winning Brands CEO Eric Lehner explains that this approach is more sustainable. "Explosive growth is great to talk about, but is not necessarily the most desirable form of expansion. Every normal human being and business organization does a better job when ramping-up up at a natural pace. Our view is that the developing pattern is the most important thing to evaluate. Are consumers satisfied? Are participating retailers experiencing repeat business and making money? Is our organization avoiding needless mistakes that can so easily be made in haste? If these conditions remain positive, then growth and continuous quality improvement will result — it's as simple as that. Building an internationally favourite brand is worth a few years of dedicated effort to get it right. Our early stakeholders have seen the systematic approach. Now the world at large is interested, for which we are grateful. The Winning Colours phenomenon is becoming an emerging international success story," Lehner observes. Australia, like the United States and Canada, has many channels of distribution and trade sectors for which Winning Colours Stain Remover is an excellent fit. "We are always carrying out market testing to see where the planted seed can grow well — when the conditions are right, we proceed," says Lehner, adding, "Creativity at Winning Brands is just as important to our emerging success as the ability to be orderly in implementation. Many companies are primarily either creative or process driven, not usually both; we are equally at home with both approaches, but these two different kinds of thinking need to be applied appropriately. At the foundation of it all is financial discipline. Our orders for Winning Colours at the wholesale level last week were approximately $65,000 but we don't have 'typical' weeks yet, so we need to be careful. We've had less per week of course, and more in a given week, but the routine is not yet established for this emerging consumer favourite. If we retain an astute balance between developing creative strategies and managing them sensibly, then accelerated growth is likely. Eventually the six-figures per week will emerge as the new benchmark, and so on. Perhaps by that point we will be able to count Australians amongst our international shareholders too. We are already thinking of a suitable special welcome for our Australian friends when that happens." (Mar 23, 2009) T minus Zero and Lift-off” as Winning Brands Corporation’s first-ever continental Sweepstakes launched on-schedule and on-budget this weekend. The company www.WinningBrands.ca (Pink Sheets: WNBD) (Frankfurt: WMU) enters a new era of marketing sophistication for its Winning Colours Stain Remover brand as Winning Brands deploys an array of field resources to grow its store presence and consumer awareness in 2009. All persons of the age of majority (18 in most jurisdictions) amongst a population of approximately 300 Million in most U.S. states and Canadian provinces became eligible to enter the 2009 $100,000 Winning Colours Stain Remover Sweepstakes on Friday at midnight - and the launch seems to have gone without a hitch. Official sweepstakes rules are posted on the company’s website, running to November 22, 2009 to coincide with the conclusion of the NASCAR racing season. The intention of Winning Brands to launch a two-country sweepstakes was revealed on the company’s website in February to coincide with introduction of Winning Colours Stain Remover in the 2009 Official NASCAR Annual, “RacingOne”, in which motorsports fans are treated to a special promotional code on page 3. That code remains valid to November 22nd as well. The 2009 RacingOne Annual and Winning Brands’ double-page-spread was first distributed at the Daytona 500 and is available at every NASCAR race weekend until the end of the season – as well as at bookstores and other retailers across the USA. Winning Brands’ production subsidiary, Niagara Mist Marketing Ltd, is the sweepstakes sponsor in 2009. An agreement between Winning Brands and Leading Points has been executed by which Leading Points will be authorized to represent Winning Brands in placing products on the Army and Air Force Exchange Service (AAFES) Source List, the Navy Exchange Service Command (NEX COM) Source List, the Coast Guard Exchange System (CGES) Source List, and the Marine Corps Exchange System (MCX) Source List amongst other activities in the nature of military procurement. The combined market reach of the Exchange stores exceeds 30 million people. Winning Brands is Featured in Racing One Magazine!